In Un Paradise In Terra tapestry we see a peacock in a garden scene by artist Pannosian. 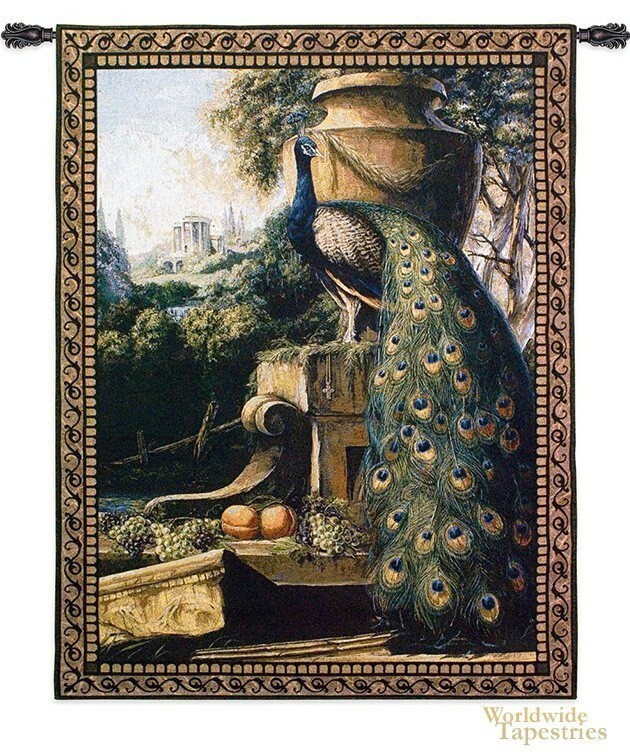 In this tapestry, the peacock is resting on a garden urn which is laden with grapes and orange fruit with some ancient buildings seen in the background. Un Paradise In Terra or 'Paradise on Earth' is hinted by the title of this work to suggest that this is a rendition of an idyllic garden. The location and situation behind this scene is mysterious as to the origin and story of these paradise gardens. This tapestry "Un Paradise In Terra" is backed with a lining and has a tunnel for easy hanging. Note: tapestry rod and tassels, where pictured, are not included in the price.